America is about freedom. We believe in strong families, patriotism, God, and justice. We won’t bother you if you don’t bother us . . . well, that’s the way it should be. 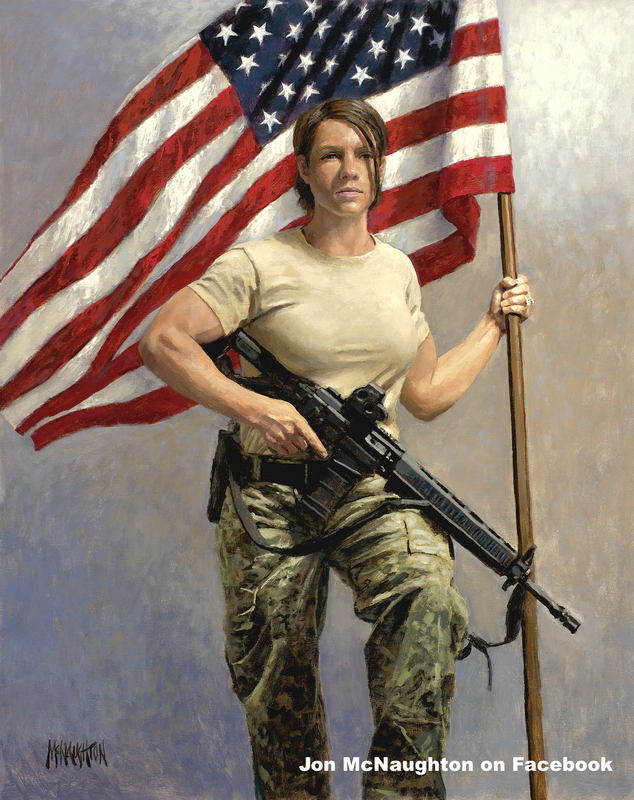 The purpose of this painting is to show the strength and honor of the American woman. You could consider her a female soldier or the Mama bear that you don’t want to mess with. Either way, she is not afraid to face the opposition that wants to infringe upon her God given rights. In today’s society the rights of an individual have been reduced to what many people perceive as necessary. The Federal Government continues to encroach upon individual liberties, as the First and Second Amendments of the Constitution are under attack. Here, the woman holds a SIG 556 Firearm as her weapon of choice. Her finger remains in the safety position, and she is well trained. Had this been Joan of Arc she would have been holding a sword with just as much fervor and determination. The American woman will never give up or back down and when she is threatened she will---Take a Stand!.